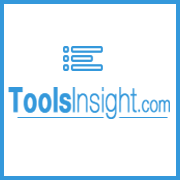 Toolsinsight.com helps people to take informed decision about various online tools available over the Internet today. There are numerous online tools that offer more or less same service with bit of different options and features in different categories. So, our purpose is to help individual and companies to make the right choice for themselves in the easiest possible way. Our goal is to provide best comparison of online tools by providing genuine and unbiased reviews from other site owners just like you. We do provide our own expert reviews, but thoughtful reviews from longtime users who have already used a particular tool are far more helpful for you to decide whether you should go for that particular tool or not. Yes, we do provide great deal of genuine and unbiased reviews but this is not it. We are planning and working hard to bring you live comparison of online tools. Once it is functional, you can then easily compare online tools side by side and choose the best tool for your website or business. Not only that, our blog section is already up and running and is goldmine of useful information and other resources. In addition to that, we are also planning to offer special coupons of online tools so that you always get the best deal of your hard earned money. Our motto is very straightforward, i.e. to help you find the best online tool or service for your website or business so that you can grow to your full potential. But it is also true that we are also a business, and we are hugely dependent on our user's trust. That's the reason why, we are completely transparent about our business practices. Any website like us needs cold hard cash to build, run and maintain. We are small but have a dedicated team of programmers, writers, editors, webmasters and bloggers whom we pay for their precious time and skill that they put in our website. Want to know where the fund is coming from? Well, the answer is simple; we earn a referral fee when you subscribe to any of the plans from various tools listed on our website. It doesn't mean anything you buy using the links of our site will cost you more or we will be able to see or access any of your personal information from that. In fact, our deals often save your money as venders often give special discounts to our users. This is how we are funded and keep up the good work by providing you honest, relevant, accurate and up-to-date information. But that doesn't mean that we are interested in getting you to buy junk or useless stuff which is not right for you. We only give you best that suits your need and pocket. We are here to stay not to con our loyal users by any means. We are constantly working on this site to give you better experience and best that you deserve. So, if you find anything wrong or have any feedback; please don't hesitate to contact us. Your opinion is always precious to us that will help us grow.